Two ships proved they were better than one this weekend at Port Everglades, when Sevenstar Yacht Transport vessels Spielgracht and Dijksgracht tethered together to use cranes on both ships to lift one yacht into the water in preparation for the Fort Lauderdale International Boat Show opening October 31, 2013. A brand new Ferretti yacht model Navetta 26, straight from the shipyard in Italy, was too heavy to be lifted by a single shipboard crane. So, using a little ingenuity, expert piloting and a lot of power from Seabulk Towing’s SDM tug New River, the two Seven Star ships were pushed and tethered together so that the cranes aboard both ships could be used to lift the 140-ton yacht. "Previously, this style of operation has never been conducted in Port Everglades," said Chief Harbormaster Conrad Strong. "Typically, a yacht of this size would be lifted by a dockside mobile harbor crane or gantry crane. 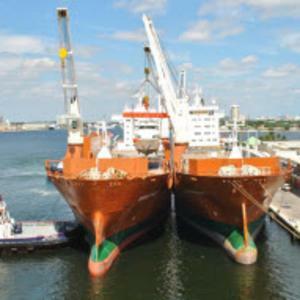 The advantage is that transport company can save some money by using their own cranes as long as they have two ships in port at the same time.